Maria feels innovation is important to Guatemala: “Small countries like ours have brilliant minds too but we need to work on the methodology and resources to help the teams create really worldwide solutions." Maria supported Guatemala City's local organization that served as host for the 2015 International Space Apps Challenge in order to grow the projects created during the event. Over 135 participants took part in the event held at the University of San Carlos. Maria is the business development coordinator for Campus Tec, which is an incubator that includes over 100 high tech local companies. As a result of her professional experience, Maria and team offered project acceleration opportunities for projects created during Space Apps. She is coordinating a virtual project accelerator: to focus the post-Space Apps project team efforts and help provide access to resources and support. “You [NASA] have the leadership. You have the people - scientists, professionals, etc, that provide the guidelines and projects. I think what NASA is doing is brilliant, you are putting together a giant collaboration group where we can access young minds everywhere to solve problems." 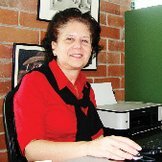 María Mercedes Zaghi has two decades of experience in implementing projects and entrepreneur efforts related to Information and Communication Technologies in Latin America. She leads business development for Campus TEC, the first technology park in the Central American region.